PaintShop Pro now boasts even more features, but does it give Adobe Photoshop anything to worry about? Steady improvements ensure PaintShop Pro X8 keeps up with the latest cameras and image-editing tools, offering broad appeal and good value for money. Some tools are sluggish, though, and it's not always beginner friendly. The latest version of Corel's all-in-one image editing program costs less than an annual subscription to Adobe's Photography Plan, and it's a 'perpetual licence' so you pay just a one-time fee for this version. PaintShop Pro is Corel's rival to Adobe Photoshop and promises powerful image editing abilities for a much lower price. 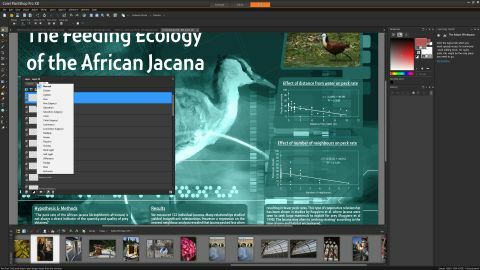 Version X8 adopts the same user interface as its predecessor, but adds several feature improvements like text wrapping, enhanced raw file editing and new lens correction capabilities. As with previous versions of PaintShop Pro, the user interface is split into three sections: Manage, Adjust and Edit. In Manage, you've got an image browser and file manager similar to Adobe Bridge, where you can quickly navigate file folders, display image previews and examine EXIF data. All common image file formats are displayed, including raw files, with raw photos from recent Canon, Nikon and Sony cameras displaying flawlessly. Various viewing formats are available, including a map view to geolocate your image capture locations. When you've hit upon an image in need of a quick edit, switching to the Adjust tab reveals a simplified editing interface similar to Lightroom or on1 Perfect Effects. Here you can use simple sliders to make common enhancements like boosting colour saturation or removing image noise. You'll also find a selection of around 100 effects filters here. Called Instant Effects, they're split into various categories such as Landscape, Portrait and Film Styles. Multiple Instant Effects can be applied to a photo, but whilst the adjustment sliders can still be used to tweak the overall look of your image, the Instant Effects themselves are not customisable. As well as Instant Effects, the Adjust workspace also contains portrait touch-up options for whitening teeth, removing red-eye and even slimming a waistline.